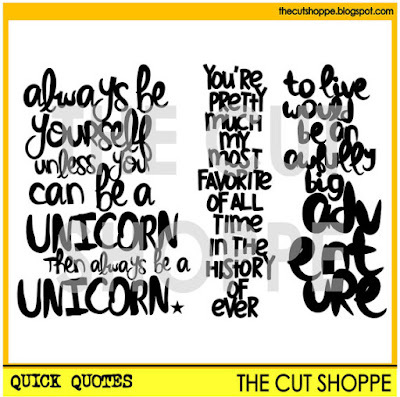 I have a layout on The Cut Shoppe blog using the new Quick Quotes cut file! I was immediately drawn to the quote from Peter Pan. 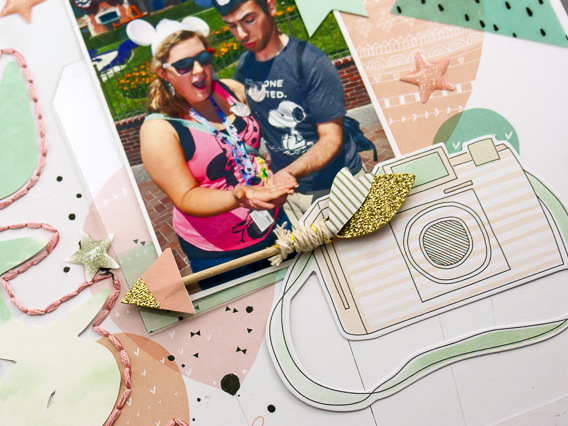 We're getting ready to go to Disneyland next month, so I've been inspired to scrap more Disney pictures from our honeymoon! I have a picture of us "holding" Tinkerbell, and I thought it would be perfect for this cut file. I wanted the focus of the layout to be the quote, so I enlarged it and stretched it to make it a bit wider, and then used the offset tool to create a template to stitch around it. I used a patterned paper that already had a large, focal print on it, so I used that instead of layers and kept it pretty simple. Now that I've used the Peter Pan quote, I can't wait to use the other two! Thanks for stopping by today!